orange colored construction site containers. accessible via stairs and walkways. Auslieferungsbüro mit Abfüllstation für Ölfässer, die dem gealterten Bausatz beiliegen. Small, stationary band conveyor installation to be used during the sugar beet campaign. Discover the many options you have with the Auhagen modular system! 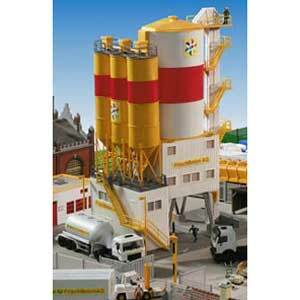 This is another basic model for our company complex August Hagen AG in a modular construction system. With polished copper boiler in the brewing house. Interesting lighting effects when illuminated. kiln and stack plus oast house for brick blanks.